A stylish compact wall hung vanity unit suite, perfect for cloakrooms or en-suites. The quality wall hanging cabinet with gloss white finish comes with a chrome handle and provides practical storage. Features a high quality 1 tap hole ceramic basin with overflow. 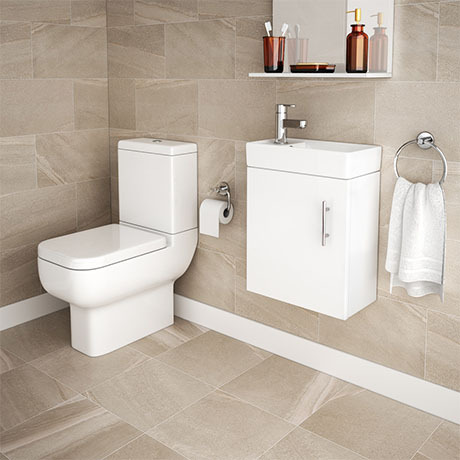 The Series 600 is one of the most space saving toilets on the market. The close coupled modern toilet only projects from the wall by 595mm. Despite its contemporary styling and air of quality, it is incredibly affordable modern toilet. This stunning minimalist bathroom suite complements any modern bathroom. Comes with a 5 year guarantee. "Good quality, value for money."